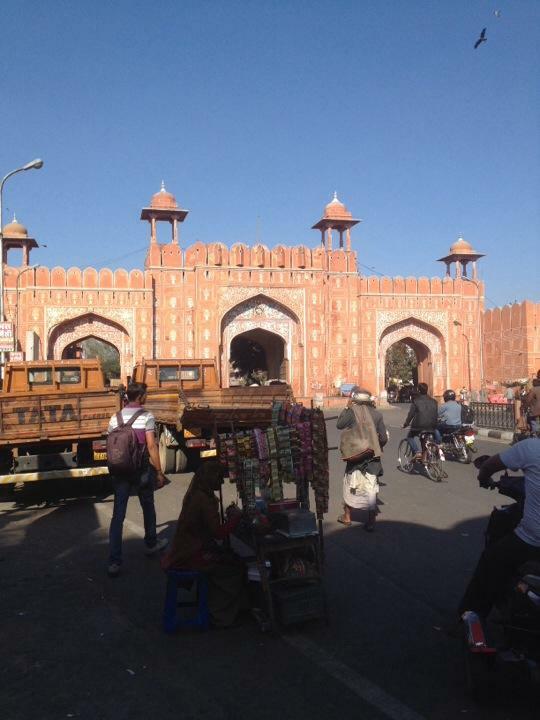 For the past two days we have been exploring Jaipur, India's pink city. It is so named because of the pink clay the buildings are made with. The city, particularly MI road is hectic and engages all your senses. The pink clay is bright and shines in your eyes, the traffic is congested so there is a constant din of horn honking, the ground is dusty and littered leaving a powerful smell of decay. That may all sound terrible, and perhaps to some it is. However I find it unique and engaging coming from New Zealand. We have had several beautiful meals, courtesy of lonely planet recommendations. These are always cheap, and I have found myself scoffing at $7 meals, which turn out to be fit for two people in any case. Everywhere we go people seem fascinated by us. Every rickshaw driver seems to ask me if I have a girlfriend, and then how many. Mark will then chirp up and say that I have 3-4, at which time we seem to gain much more respect. One of our guides asked this question to Mark. Upon hearing his answer in the negative the driver then exclaims that he is so good looking that it is a travesty. I have a picture of Mark's face, covered in delight, should anyone like to see it. Tomorrow we are hopeful of travelling to a tiger sanctuary for a safari, permitting that we can organise it.